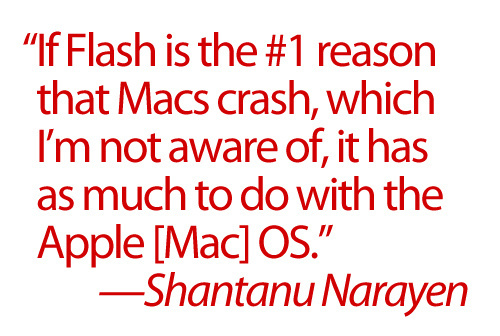 We told you yesterday about Steve Jobs 3500 word open letter addressing his thoughts on Flash stating that, “Flash was created during the PC era – for PCs and mice. Flash is a successful business for Adobe, and we can understand why they want to push it beyond PCs. But the mobile era is about low power devices, touch interfaces and open web standards – all areas where Flash falls short”. Jobs also went on to do his usual preaching about how HTML5 is the future of open web standards for both mobile devices and PCs. Luckily, the Wall Street Journal was able to get an exclusive interview with Adobe CEO Shantanu Narayen to get his response to Jobs “thoughts on Flash”. Thankfully we have it embedded for you below. What do you think about both sides of the argument? Do you think Flash can possibly win out over HTML5, which is now even being touted as the future by Microsoft? I wanted to listen to Adobe’s response to Steve Job’s recent open letter regarding flash. I decided to watch the video here. Unfortunately, I can’t watch it on my computer, since it is painfully slow in starting up and stalls constantly. It’s in Flash. Who needs apple anyway overpriced tat give me a PC any day sick of repairing apples, only thing good they have is cosmetics they look nice, “pig with lipstick on” flash was/is buggy even on windows but at least they do make an effort to have a flash version for any OS on the market that is not easy, apple only for develop 1 platform which is loosely based on BSD but in a new skin and they cant even get that right. The video runs smothly on my very lightweight Ee PC 701 with a mobil3Gslow-modem, XP and Firefox 3, no buffering or choppiness anywhere. If you have problems its not because of the video but maybe your hardware or browser? I run both PC’s and Macs in my studio. Since Mac went ‘Intel’, I’ve seen them run like wounded bulls. Apple really have a large set of balls to pin-point other companies bugs and technological flaws when clearly they are far from perfect. Let’s face it, Apple has not yet released a mobile device with a decent battery. I think the CEO of Adobe is right, it seems to me that Apple created (on purpose) a scenario in which he could say “no” to flash. Flash runs fine on every Windows system I’ve used, No issues with Linux, so tell me why does it crash on Mac OSX? Or did Apple intend for this to happen from the beggining? Mobile devices .. fair enough Jobs has a claim there. Previous Entry: Is HP Slate Really Dead? Or Palm Acquisition Another Step Towards It?